According to the Bureau of Labor Statistics (a division of the United States Department of Labor), nationwide more than 3 million workers suffered non-fatal work related injuries in 2013. This means that 1.7 out of every 100 workers in America was injured. During this same period, 4,405 workers lost their lives in work place accidents. The rate of fatal work injury for U.S. workers in 2013 was 3.2 per 100,000 workers in America. Not surprisingly, the majority of job related injuries and deaths occurred in the manufacturing and construction industries. But laws are different when it comes to workplace accidents. Employees suffering injuries while working within the line and scope of their employment in Alabama are entitled to compensation for their injuries only to the extent provided for by law. In the event a workplace accident results in death, the employee’s dependents may also be entitled to compensation as provided by law. These claims may arise under Alabama’s Workers’ Compensation Act, the Longshore and Harbor Workers Compensation Act or the Federal Employees’ Compensation Act. In general, a covered employee’s sole remedy against his or her employer for injuries suffered while working within the line and scope of their employment is to pursue a claim for those benefits to which he or she is entitled as provided by the applicable statutory Act. Alabama’s Workers' Compensation Act, the Longshore and Harbor Workers Compensation Act and the Federal Employees’ Compensation Act are designed to guarantee that injured workers receive certain monetary and medical benefits for the work-place injury or illness suffered without having to prove that the employer was at fault in causing the injury or illness. Sounds simple, but it isn’t. Unfortunately, the benefits under Alabama’s Workers' Compensation Act, the Longshore and Harbor Workers Compensation Act and the Federal Employees’ Compensation Act often do not fully compensate an injured worker for the injuries suffered or the disability that may result therefrom. An employee’s benefits are generally limited to lifetime medical treatment for the work injury; disability compensation payments for the period of time an employee is held out of work by the authorized treating physician; and a modest monetary award for permanent impairment or disabilities. Disability benefits and monetary awards are generally “capped” pursuant to certain schedules. These “caps” usually result in modest compensation when compared with the salaries workers were earning immediately prior to their injuries. All monetary benefits recoverable in a workers’ compensation claim are based on the “average weekly earnings” by the employee in the year immediately prior to the work accident. Thus, calculating the “average weekly earnings” and the resulting “weekly benefit” correctly may have a substantial impact on the value of the claim. The limitations placed on periodic disability payments, for example, usually result in modest compensation when compared with the salaries workers were earning immediately prior to their injuries. In other words, benefits often fall short of your old paycheck. If you are injured at work, you should notify your employer of the injury as soon as possible. You should report the injury in writing and keep a copy of the report for your records. In most instances, the employer has the right to select the physician from whom initial medical treatment shall be provided. It is important to immediately report the work accident to your employer and ask your employer to provide medical treatment. Immediately reporting the injury and filing a claim quickly helps ensure that your benefits will start promptly and will also help to avoid claims by the employer that they did not know you suffered a work accident or that the injury you complain about was suffered at home or away from work. As with all injury claims, there are time limitations and filing requirements which need to be met if a worker is to pursue his or her claim rights. 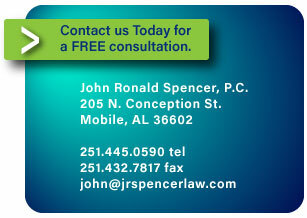 At John Ronald Spencer, P.C., there is never a charge to meet with you. We’ll determine whether you have legal rights that must be protected. The initial consultation is always free. You have nothing to lose if you make the call. But, you may lose all of your legal rights if you do nothing.